NEW! CoinRingUSA® Stainless Steel Stabilizer Folding Cones and Spacer Set! This is the original Stainless Steel Stabilizer Folding Cones and Spacer Set that I personally designed back in early 2016 that may be imitated by others, but not duplicated. If you look closely at others' stainless steel cones, a very rough surface finish can be seen on the cones which reduces efficiency. These Universal Stabilizer Folding Cones and Spacer Set are machined from wear-resistant and hardened stainless steel, eliminating the cost of purchasing additional plastic cone sets due to eventual wear-and-tear. "I love my big SS cone for my challenge coins, but these small SS cones are a game changer I love them even more because I like to do my initial folding with my Durston it has nice even pressure a lot better than that HF 1 ton which is not even pressure resulting in wonky rings that you have to work on longer to straighten them out. Thanks Again, Martin & Have A Happy New Year!!!" "Quarter rings are my biggest sellers. I do large production runs of quarters, so I don't need a stuck coin slowing me down. And we all know how frustrating is can be to remove a stuck coin from one of the older cones. These are just what the doctor ordered." "Awesome folding cones, so glad I purchased this set, never have to replace it"
"These cones are on another level. Just put plumbers tape on the cones so you don't ruin the inner detail and its golden." "CoinringUSA had the best folding cones on the market! I thought it didn't get any better than that, until now! Cones you never have to replace again? Coins that never gets stuck on your cones? Really? Well I've tried them out and you can believe all the hype, it's true. These things are fantastic. These cones are smooth and they slide easier through the folding process. Not to mention zero loss of detail thanks to the Teflon tape. I must admit I bought 2 very large steel folding mandrills off eBay. Having said that these new folding cones from coinringusa are so much easier to work with. A must have for the Serious Coin ring maker! Thank you Martin and keep innovating. Sincerely James." * The improved smallest-size folding cone is now machined to be able to fold over any size coin with as small as a 1/4" center-punched hole, all the way up to a 5/8"+ center-punched hole with the largest cone. * To use these Folding Cones, simply set the coin level into your reduction die, insert an appropriate size folding cone into the center punched hole, and then begin to press the coin down into the die. These stainless steel stabilizer folding cones are a more effective and efficient option than using the delrin bearing balls, metal bearing balls, or even the softer phenolic (light brown-colored) plastic folding cones. Their design allows them to do a much better job of keeping the coin level as it’s being folded over into your reduction dies when using either a Ring Sizer Machine, an Arbor Press, or a Hydraulic Press. * The improved smaller 1/4" size folding cone is used in folding over any size coin with as small as a 1/4" center-punched hole. This is the first cone that you would use when beginning to fold a Silver Eagle-sized coin that has a 5/8” inch (15.8mm) center hole punched into it; as well as any sized coin with either a 1/4" (6.35mm) hole, a 3/8” inch (9.5mm) hole, or a 7/16” inch (11mm) sized center hole punched into it. *The 1/2" size folding cone is used in folding over Half Dollar, Dollar, and American Silver Eagle-sized coins. This is the first cone that you would use when beginning to fold a Half Dollar-sized coin over with a 7/16” (11mm) hole in the center. 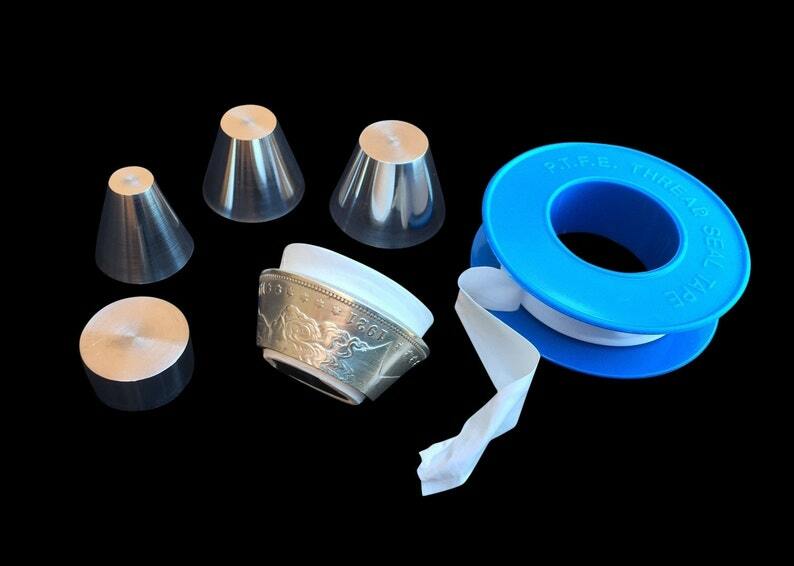 *The 3/4" size folding cone is used in folding Dollar and American silver Eagle-sized coins. This is the final cone to use when finishing a Morgan Dollar sized coin and also the last cone to use (with the larger-sized flat spacer provided) when you’re finished folding an American Silver Eagle-sized coin. 2.) I like to wrap from the larger diameter end of the folding cone to the smaller diameter end about 4 to 5 times around, making sure to wrap evenly and to overlap at least half the width of the previous tapes' wrap. 3.) When using a ring sizer machine, the first initial press (fold) is done with the improved Stainless Steel Starter Cone when using either of my 2 "Stabilizer” Reduction Dies. This is because many ring sizer machines such as the “Durston” model have a very low clearance underneath the ram head; and the starter cone allows room for the initial first fold. You can then use the stainless steel folding cones to complete the folding process. (Coins are not included and are meant for reference only). 1. Wear-resistant and hardened stainless steel is used. Each folding cone is CNC-machined and personally inspected by hand by expert machinists. 2. This will likely be the last set of folding cones that you’ll ever have to purchase! 3. My customers always come first! I can always be reached through Etsy, by e-mail directly, or by leaving me a comment on my blog site. 4. The level of quality of my tools is simply not duplicated elsewhere. 5. The optimal degree of angle is used on these folding cones for maximum efficiency and ease of folding your coins. 6. I have a passion for both making coin rings as well as creating the highest quality coin ring-making tools on the market today. That's why I've created a platform where people can go to get their questions answered about all things coin rings; as well as ask questions and even leave suggestions. Please visit my new blog site at: CoinRingBlog.com for coin ring making tips, tricks, and tool updates. 8. Why pay a little less for plastic cones that will wear out on you? Buy from CoinRingUSA® and get the best and longest-lasting quality coin ring tools! --- CAUTION! This kit contains small parts and can be considered a choking hazard. Please keep away from children and pets and store in a safe place. --- Always wear safety glasses. --- Keep fingers, long hair, and loose clothing away from any pinch points or open flame. --- Make sure to anneal, (heat, then quench) the coin often as you're working it. I feel I can’t have enough tools in my coin ring making arsenal. There’s always a time when a different tool is needed. Glad I got these and I already needed to use one of them. Worked out good. Quality made. Received on time as promised. Set looks good. Can’t wait to try them!